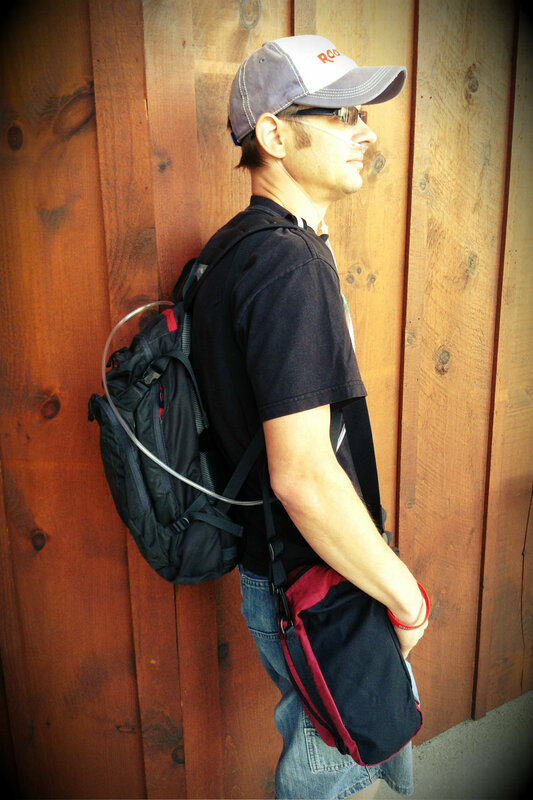 In this post I’m going to share a story with you that I have shared with few people. It begins a little over a year ago, in October of 2012. 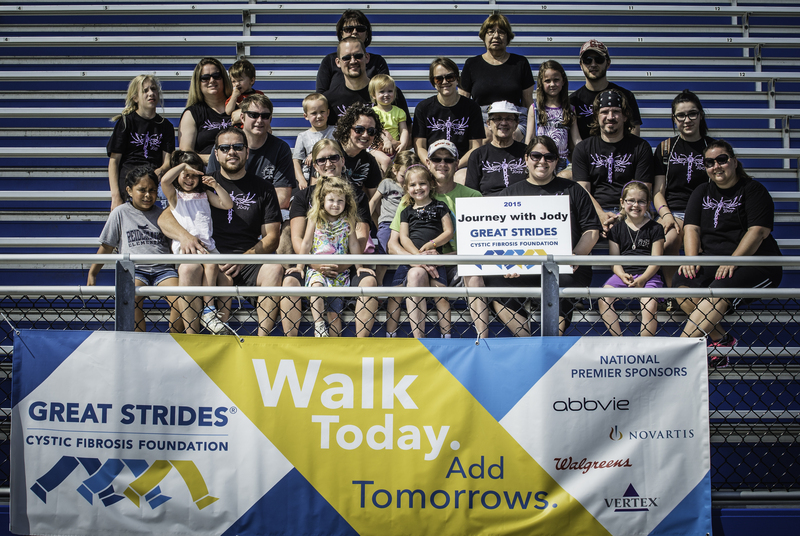 This was the time when Jody initially began to experience shortness of breath and frequent hospitalizations. 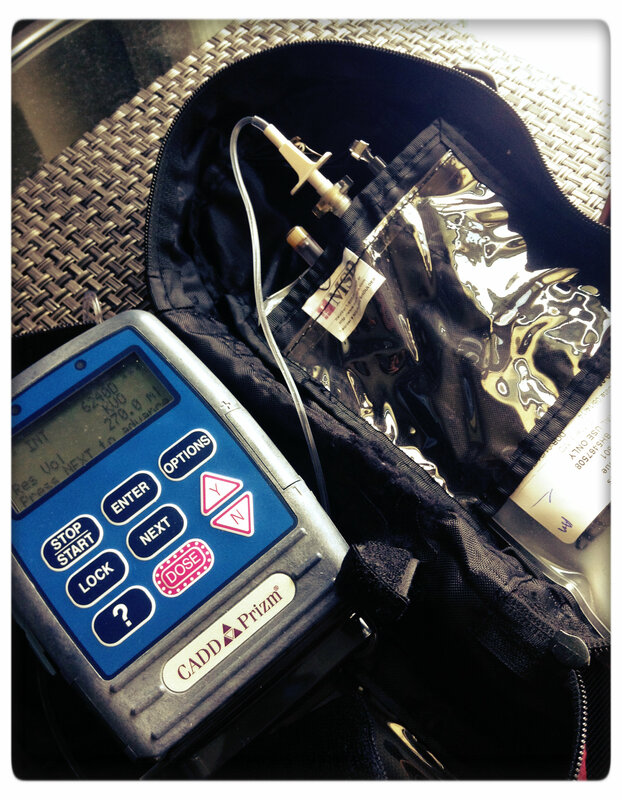 It was the first time our lives were being seriously impacted by Cystic Fibrosis and I was having a hard time dealing with it. I felt, in one word, hopeless. 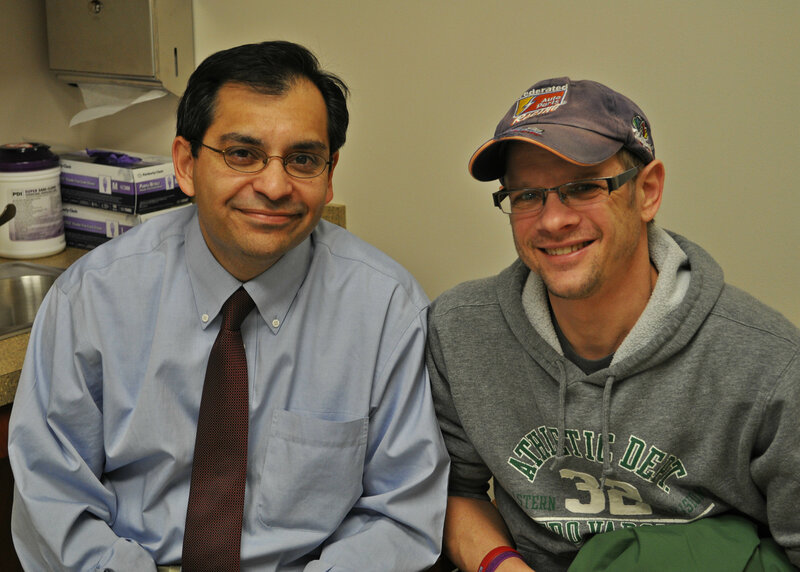 It was hard to stay positive about a progressive disease with no cure. Every major coughing spell (which happens a lot for someone with CF), was a reminder, a smack in the face, that we couldn’t get away from this disease. I missed (and still do), being able to do the things we’d always done. 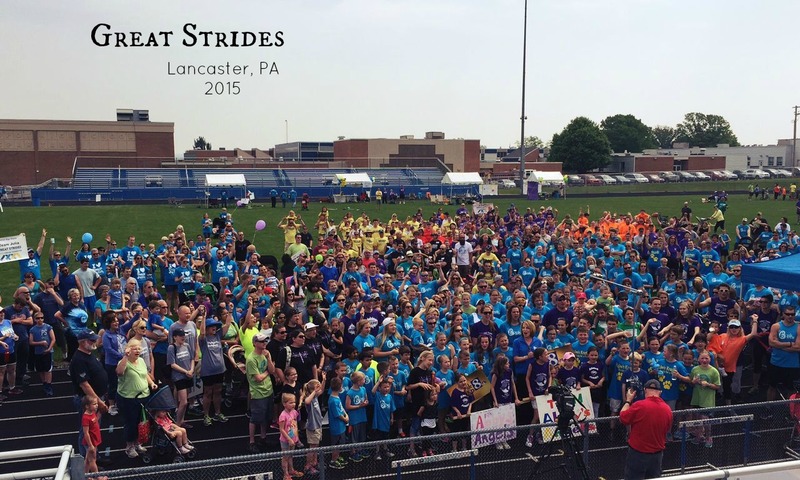 I believed the lousy statistics about Cystic Fibrosis and lung transplants. I began to dwell on the negatives, fearing the worst for our future. It was a hopeless feeling. And so I began to pray that God would restore my hope, but I wasn’t prepared for the way that He would do it. There have been few times in my life when I can say with confidence that God spoke something to me, this was not one of those times. This time, God’s message to me was loud and clear. It came in the form of random daily encounters, always with the message of hope. I wish I had written these things down because I don’t remember all of them, but I’ll share with you some of the ones I do (in no particular order). One day I was driving by myself in the car and was passed by an 18-wheeler with the word “Hope” written in big bold letters on the side of his trailer. One morning I was sorting through a box of childhood things my Mom had given me and found, at the very bottom, a daily inspirational flip book titled, “Words of Comfort & Hope” (I don’t recall having this as a child, nor do I know why I would have ever needed it). I love to drink my coffee/tea in a big mug. This summer I was browsing at a yard sale and glanced at some mugs a lady was selling (I love to yard sale shop, but have never looked at mugs before, I just don’t need any more). Oddly enough, I could see that of the batch she was selling there was one big mug in the group. 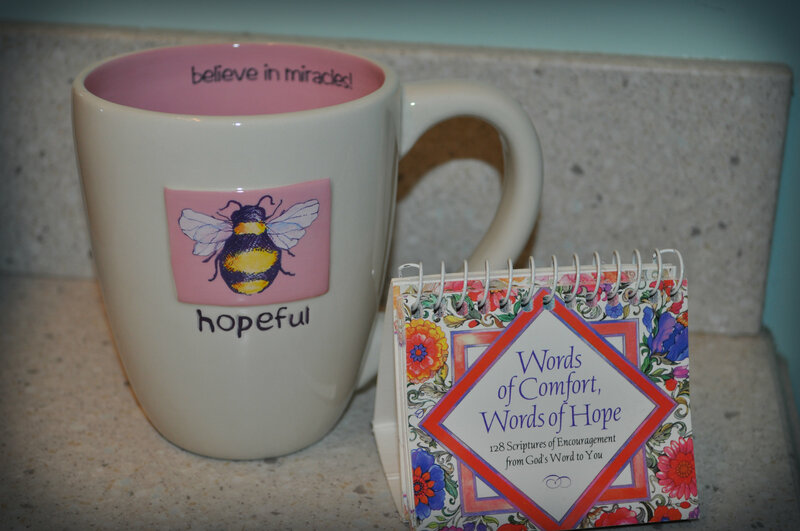 I walked over, picked it up and had to chuckle when I read what was written on it, “Bee (actually a picture of a bee) hopeful, believe in miracles.” It was probably the best 0.25 cents I’ve ever spent and has become my favorite mug, and a daily reminder. One day I received a thoughtful message from a relative letting me know that she is praying for me for hope. Another day I walked into a patients room at work. Her bedside table was covered in books. I asked if she likes to read (an obvious question I know). Her response, having never met me before, was, “Yes, and I have a book for you. It’s called “Hope Beyond Reason.” She went on to explain that it was a book about a pastor who had cancer and wasn’t expected to live, but did. She didn’t know my story. One of these days I’ll get around to actually taking her advice and ordering the book. There were more encounters like this, they happened often, and I couldn’t get away from them. I knew God was trying to tell me something, and even though I had prayed for hope, I still rejected it. As God spoke to me, I spoke back, pointing out those ugly statistics and grieving for others close to me who had lost loved ones far too soon. But the messages continued until one day, after yet another sign, I surrendered the fight. I remember literally saying aloud, “Okay, God, I get it!” And you know what happened? The messages/encounters instantly stopped. After a month or two of signs from God and resisting His message, He knew I had finally gotten it and accepted it. Receiving God’s message in my life was actually the easy part. Living it out was, and still is, the hard part. Jody will continue to get sick, sicker than I’ve ever seen him. Both my responsibilities and stress level will increase. 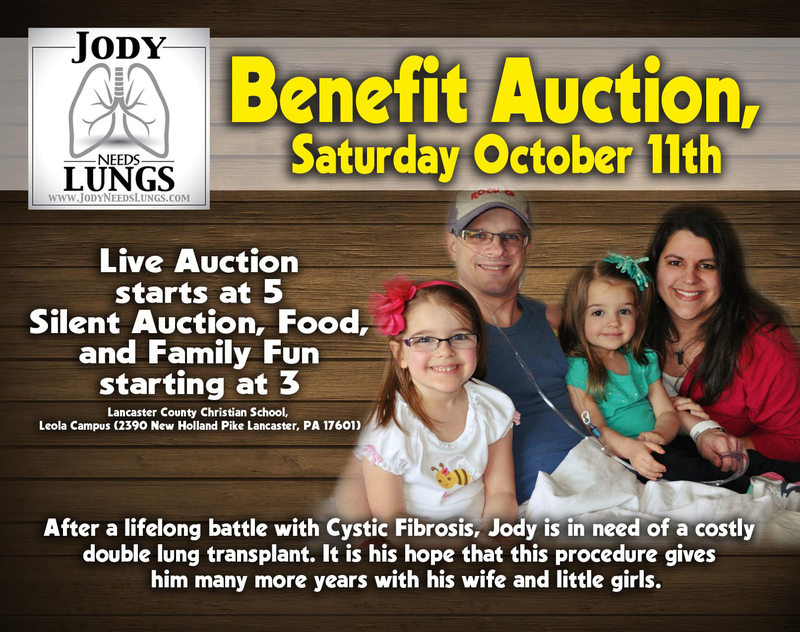 People with CF are still dying (just this past week another CF wife lost her husband). Despite all of this, God is calling me to choose hope. And so, I hope that the progression of Jody’s disease will be mild and that we’ll be able to accept and adjust to each new stage. I hope that his transplant will come at the most perfect time, before he’s too sick, making recovery extra difficult. I hope (and this is the hard one for me), that his transplant will be a success and that he will live far beyond the time that statistics say he should. Am I scared to death of the “What if’s?” Absolutely. There are many impacts of Jody’s disease that I fear. Obviously I know that having hope doesn’t mean that everything is going to turn out the way that I want it to, it could be the exact opposite. 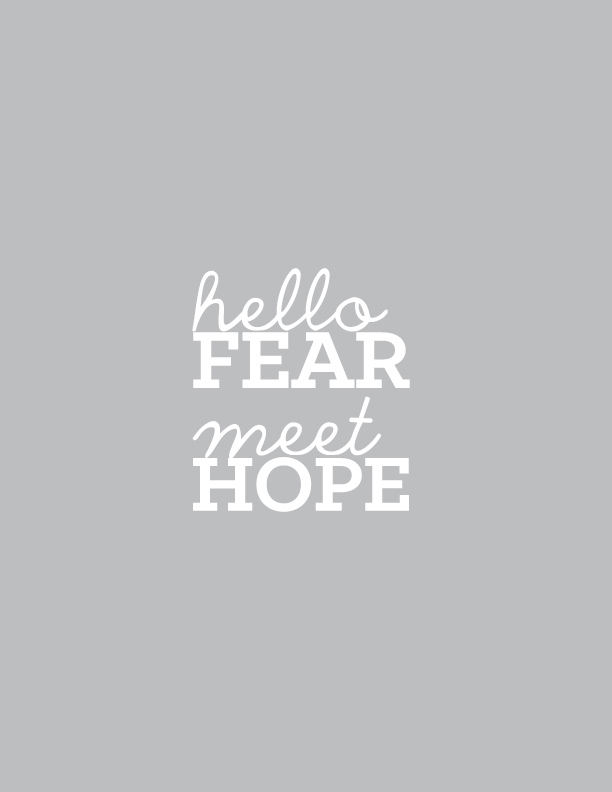 Regardless, I am working to turn my fear into hope. I am choosing to believe that having hope in my life means that no matter what happens God is not going to leave me hanging. As a reminder of all of this, I bought myself a “hope” necklace. 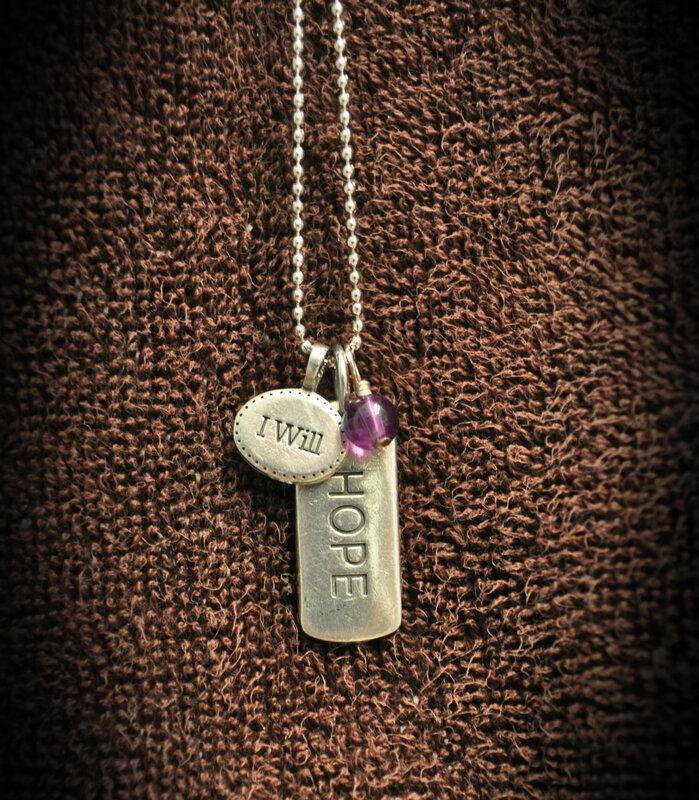 One charm is purple, the color which represents Cystic Fibrosis, and the other two charms create the phrase, “I will hope.” When I put this necklace on, or when I look at it in the mirror, I am reminded to choose hope. This is a work in progress for me, but it sure beats the alternative, which is hopelessness.